Winter is the coldest season of the year. During this time, we tolerate shorter days, less natural light, and some of the worst weather conditions. Heavy snowfalls, freezing rain, and black ice are just some of the circumstances Canadians have to endure. In an effort to battle the effects of winter, and to combat these conditions, rock salt is laid on most outdoor surfaces. This mineral is sprinkled to cut through ice and snow and to prevent sliding. Though salt is useful for combatting winter precipitation, it is not quite beneficial for people indoors. White residue from the rock salt remains on boots and transfers to floors and carpets. For those wanting to keep their office space clean, this poses a problem as salt is challenging to remove. Similarly, the lack of visibility due to less natural light often makes it complicated to identify dirt, salt, puddles, and other unwanted elements on the floor. During the winter months, cleaning becomes a very strenuous task. For shared spaces like offices, performing a deep clean in the office and maintaining it become quite challenging. However, there are commercial cleaning services available, much like the ones offered at JAN-PRO. 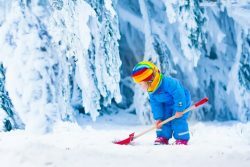 Continue reading to discover how winter can have an impact on cleaning. As the cold air becomes brisk and snow begins to fall, keeping floors clean becomes the number one priority. Snow, slush, dirt, and rock salt are tracked into the office causing white stains and increased dirt on the floors. Entryway rugs are ideal for eliminating some of the snow and dirt, but they are often left looking dishevelled and untidy while the surrounding floors and carpets look unkempt. For managers and business owners, this unpleasant appearance becomes a nightmare, especially for those who always seek to maintain a high level of cleanliness. Winter office cleaning is difficult because it requires more time, energy, and effort to remove stains properly. Not only is the arduous, but it also has to be repeated every day, as more puddles, damp spots, salt rocks, and salt stains crop up. Due to the brisk weather, many individuals resort to staying indoors more often and find ways to limit heading outdoors as much as possible. That also means that doors and windows remain closed more often than they do in the summer. With less air circulating through the office, and more individuals staying in for lunch, this gives dust, germs, and air pollutants the opportunity to collect and affect the indoor air quality. With these unwanted elements in the air, employees and customers are more likely to become sick. Pathogens and germs become trapped in the air and circulate through vents, affecting the health and well-being of those in the building. Keeping office spaces clean, such as sanitizing workstations, chairs, door handles, and many other shared areas and equipment can help to eliminate the circulation of these pathogens and office-wide sickness. Overall, winter office cleaning is essential to maintaining a sterile workspace. Although it is cold outside it is also important to keep windows spotless during the winter. As mentioned, winter tends to be the season where everything gets the dirtiest and windows are affected just the same. Salt, debris, snow, and ice all affect windows leaving a layer of grime to prevent the sunlight from shining through the glass. Winter is already known for its shorter days and less natural light, so keeping windows clean means they will be fewer obstacles in the way of precious hours of daylight. Help increase the amount of light that permeates through the windows, giving the office a much brighter appeal. If you’re an office manager, you know that keeping your office clean can become difficult during the winter months. However, hiring a cleaning service can alleviate the stress and worry associated with keeping your office in excellent condition. With professional services, JAN-PRO can help you with your winter office cleaning by providing services such as carpet cleaning, disinfecting, dusting, and many other tasks. You can also ask your cleaning professionals for office cleaning tips to ensure that your office space remains in perfect shape between sessions. For seasonal office cleaning, contact JAN-PRO. Our team of experts offers commercial cleaning services to help offices stay clean and safe during the winter. Reach out for more information on our services.